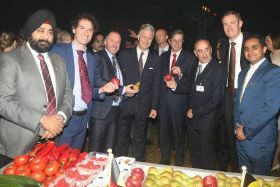 Pictured left to right: Gurdip Singh, BFV; Gert Van Causenbroeck, VLAM; Filip Fontaine, BelOrta; King Philippe of Belgium; Jan Luyckx, Belgian ambassador in Delhi; Erik Champagne, BFV; Marc Evrard, BFV; Parth Karvat, Yupaa. VLAM, Flanders’ Agricultural Marketing Board, highlighted the quality of Belgian topfruit at an official reception during a state visit to Delhi, India, last week by the Belgian King and Queen. The head chef of the Belgian Embassy created a selection of Indian dishes based on produce from Belgian orchards, demonstrating the diversity of the country’s apples and pears. India only began importing European pears a few years ago, but imports have grown constantly ever since. In 2016, imports stood at 939 tonnes, with almost three-quarters coming from Belgium. According to VLAM’s Gert Van Causenbroeck, the challenge remains to persuade Indian buyers and consumers of the taste and quality of Belgian pears, which are still viewed as an exotic fruit on the market. “Hundreds of tastings are planned to convince Indian consumers of the unique taste and quality of Belgian pears,” he revealed. Over the last decade, European apples and pears have quickly boosted their share on the Indian market. In 2007, EU apples accounted for just 0.5 per cent of Indian apple imports, compared with 9.9 per cent in 2016, with Belgium responsible for over 40 per cent of EU imports. For the first half of 2017, Belgian apple exports to India already exceeded the volume for the whole of 2016, with volumes rapidly approaching the 10,000-tonne mark. The continued closure of the massive Russian market has made it essential for Belgian topfruit exporters to find alternative markets. 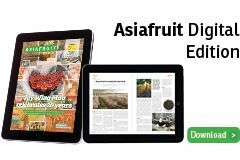 Last week saw the opening of the Vietnamese market for Belgian pears, which followed the opening of the Brazilian market earlier in the year. According to Evrard, there continues to be great potential for Belgian topfruit in India, especially for apples, with high hopes for Joly Red, a variety especially suited to the market.